My favorite pieces of jewelry to give and to receive are always customized pieces. I love to wear personalized jewelry and giving a custom piece lets the recipient know exactly how I am feeling and cherishing our special relationship. Recently, my older sister and I both went through a medical scare together and it only further bonded us together as sisters and best friends. In honor of our relationship, I wanted to commemorate it with a piece of custom jewelry and that is how I discovered Marley Jane! Marley Jane has a wonderful selection of unique custom jewelry, sterling silver necklaces, bracelets and earrings, silver rings and much more. Each piece is absolutely beautiful and I immediately fell in love with the Secret Message necklace ($39.50) in gold brass. 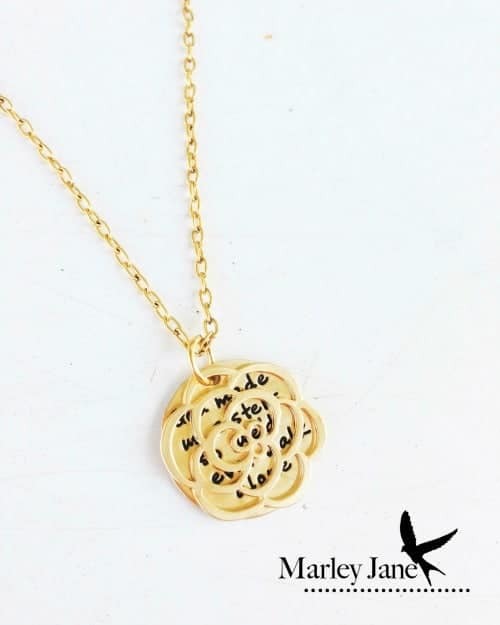 This lovely two piece pendant set can be engraved with a personal “secret message” that is accentuated and “hidden” by a beautiful matte gold flower. 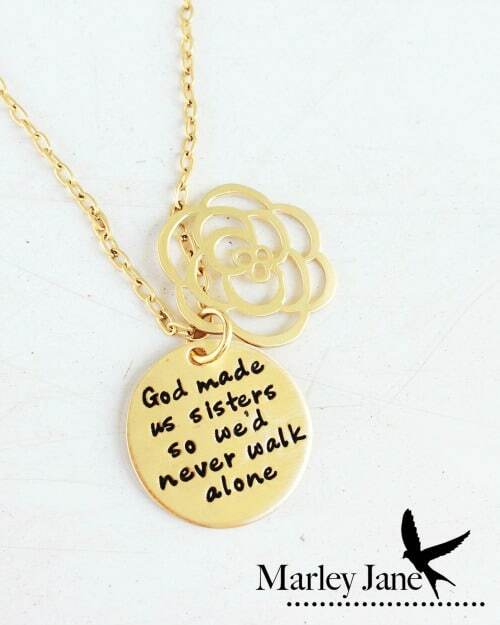 I had my necklace engraved in honor of my sister, “God Made Us Sisters So We Would Never Walk Alone”. It comes on an 18” gold plated chain and is also available in 20” if you prefer a longer length. The necklace is so pretty up close and I have had many people curious to read the message underneath…..even complete strangers have asked what it says. Whenever I put on this necklace, it brings tears to my eyes knowing how important my sister is to my life and grateful that we have both been given a clean bill of health after our medical scare. For Christmas, I plan to purchase the matching necklace for my sister so I can surprise her with it as a special gift! I am very impressed with the attention to detail in this piece as well as the attentive, friendly customer service that I received as I was placing my custom jewelry order. The jewelry designer, Jennifer is very talented and obviously has a passion for her craft. There are lots of lovely, attractively priced jewelry pieces available for purchase and these would make great gift ideas for the upcoming holiday season or a special occasion. You are invited to visit the Marley Jane Etsy shop to browse all of the beautiful pieces which are really show stoppers! Which piece is your favorite in the Marley Jane jewelry collection? i really like the custom bottle opener, i think it would make a perfect present to give my cousin and her soon to be husband! The jewelry is all really cool, but those custom wall mount bottle openers are my favorite! Like the look of the Sterling Silver stacking rings. I absolutely love the Sterling Silver Open Locket Bird Necklace Mother Daughter Sister Friend Wife Secret Message. Lovin the Sterling Silver Mothers Bird Necklace Custom Double sided,gorgeous!!! I love her silver bird necklace. I love, love, love the Sister Secret Message Lotus Necklace Sterling Silver! I like the Secret Message Necklace Flower in silver! 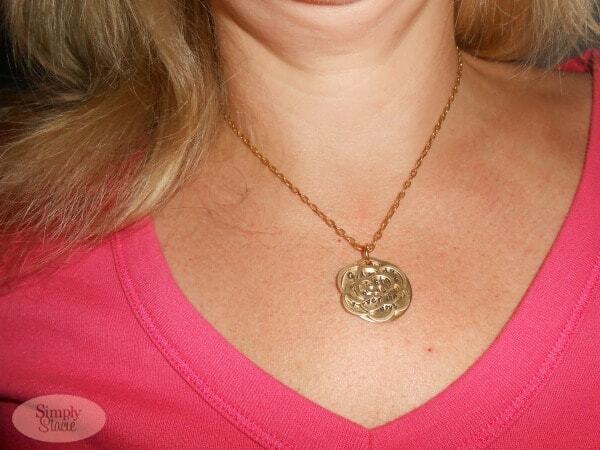 I love the Love Letter Gold Necklace! Beautiful! I like the dandelion necklace. I like the Secret Message Lotus Necklace Sterling Silver. I love the Sterling Silver Birthstone Mother Necklace. 🙂 Anything that has my sweet kiddos names on it, I love. My favorite is The love between a mother and child is forever Baby Name Date Heart Necklace. I love the Peas In A Pod sterling silver necklace engraved with three names.. I love the heart add-on charms! I like the sterling silver sunflower necklace. My girlfriend would love something like the Sterling silver birthstone mother necklace. Bangle Bracelets with 4 Silver Custom Discs would be a blessing and keep my mind on my family through-out the day! I love the hidden message necklace. I like both the Freedom Silver Necklace and the Sterling Silver To the Moon Necklace. I try to buy my daughter unique and unusual necklaces, so I will have to look at your site for something very special…. I would love to have the sterling silver stacking rings. The stackable rings are my favorite. Thanks for the giveaway!! I love the gorgeous Customizable Guitar Pick.